ClickFunnels use free t-shirts to get more users! If you’re wondering how companies can use t-shirts to grow their users and build a community, then you need to check out ClickFunnels. It’s a service to help you build any kind of marketing funnel for your website. They’ve clearly thought about it a huge amount, and baked t-shirts into this part of their customer acquisition process from the very start. They’re very smart in using t-shirts to get more users. 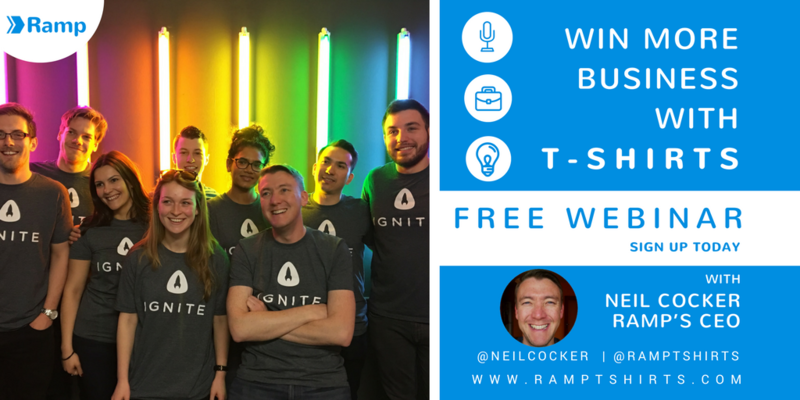 t-shirts are a huge part of how they have built a great community around their 48,000 users. I caught up with Dave Woodward, ClickFunnels’ Chief Business Development Officer, to find a little bit more about their super-smart incentive, and how it works for them. “It’s all about consumption”, starts Dave. “The faster we can get them to consume, the more likely they are to get onboard and be less likely to churn [cancel their subscription in the future]”. ClickFunnels use video to onboard customers. Once you’ve watched a few short videos, you get a free t-shirt. The idea is by that point you’re invested and hooked on what their service can do for you. The videos themselves are brilliant. Simple, but nicely put together. They just quickly take you through the process of just how easy it is to use the service, and what it allows you to do. After just 10 minutes of watching, you’re fully up to speed with what ClickFunnels is and why you should use it. The thing I love about their process is that the ClickFunnels page is completely transparent about what’s going on. This is a bribe, and they say so right at the top! The seed for the idea came from the ClickFunnels community on Facebook. So, why does ClickFunnels believe in the power of the t-shirt? This is a smart decision. Although we all have to make tough decisions based on the budget available to us, a slightly nicer t-shirt can be the difference between it being worn a handful of times then being consigned to the “for sleeping in” pile, and it being a weekly wear that gets seen thousands of times more by the colleagues, associates, and fellow delegates of the wearer. Not only do they send t-shirts out to new subscribers, they use t-shirts as part of their conference and events strategy, too. “We recently used them at conference to incentivise people to upgrade on the day. We had these great t-shirts that said “We Are Not ConfusionSoft”, which was making fun of a competitor of ours. People went nuts for them. We even had a different colour for each day”. The interesting thing here is that although they don’t explicitly measure ROI (more on that shortly), if you can encourage customers to upgrade in a service that has tiers that run to nearly $300 with a t-shirt that probably cost no more than $10 or $12 each, you’re definitely doing something right! This all ties in to the psychology of reciprocity. As human beings, if we’re given something, we’re hardwired to want to give something back. In this case, it’s often our cold, hard cash! To finish off, i asked Dave if there was anything that ClickFunnels would do differently with their t-shirts. Not really. We have 48,000 customers, so it can get kind of expensive! We give away hundreds of thousands of dollars of tshirts a year. But it’s definitely worth it. Although we don’t measure an exact return on our investment from these shirts, we know that it’s definitely worth it from the way people respond to the t-shirts and talk about them. It creates a following, and that is enough value for us. We see them around all the time. At meetups, conferences, and online. If we didn’t see them, then I’d worry! 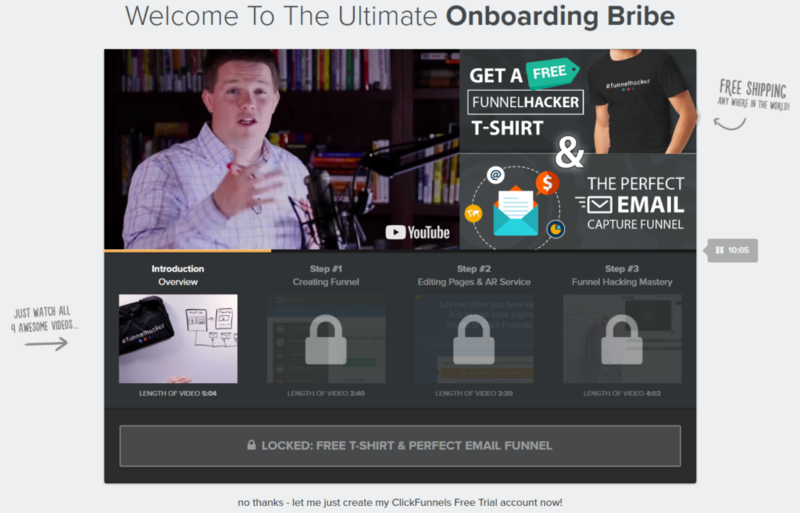 Want to get yourself a ClickFunnels t-shirt in return for watching 10 mins of video? And even better, sign up for their great service! Then head straight to their site. Or sign up for a free webinar with our CEO to get more amazing tips and tricks to building your business through t-shirts, hoodies and more! And to finish off, here’s a few more tweets and Instagrams from happy Funnelhackers! Got my clickfunnels T-shirt today. Previous Previous post: How to get more customers with promotional merchandise, and how to do it better.